African Artists' Foundation in collaboration with the Goethe-Institut bring you "Black Box" an audio and visual installation featuring the photographic work of the iconic Sven Marquardt with musical accompaniment by one of the leading proponents of techno music, Marcel Dettmann. Sven Marquardt has been part of the Berlin Techno scene since the early 1990s. Born in East Berlin in 1962, he had previously been a punk and worked as a photographer. After reunification, he started working as a bouncer, first at his brother DJ Jauche's parties, then at the Snax and its fetish parties, the Ostgut club which developed out of it, and, finally, at the Berghain, which is still Berlin's most important club today, eleven years later. In the GDR (former Easter Germany), Sven Marquardt photographed his punk friends in their black make-up on the wastelands and derelict backyards of East Berlin, documenting a subculture that officially was not supposed to exist. Since 2003, he has been photographing the DJs, bar staff and fellow bouncers at the Berghain. His pictures look like they were taken at night – even the ones that were shot in daylight. They are dark, almost existentialist-looking photographs. Marquardt likes to stage his motifs on a large scale. 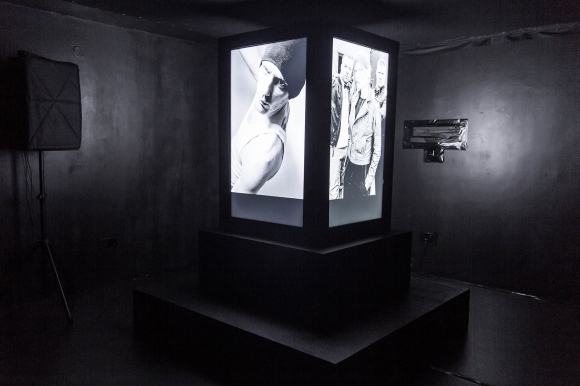 An Audio and Visual installation featuring photography from the notorious Sven Marquardt and sound by Marcel Dettmann.